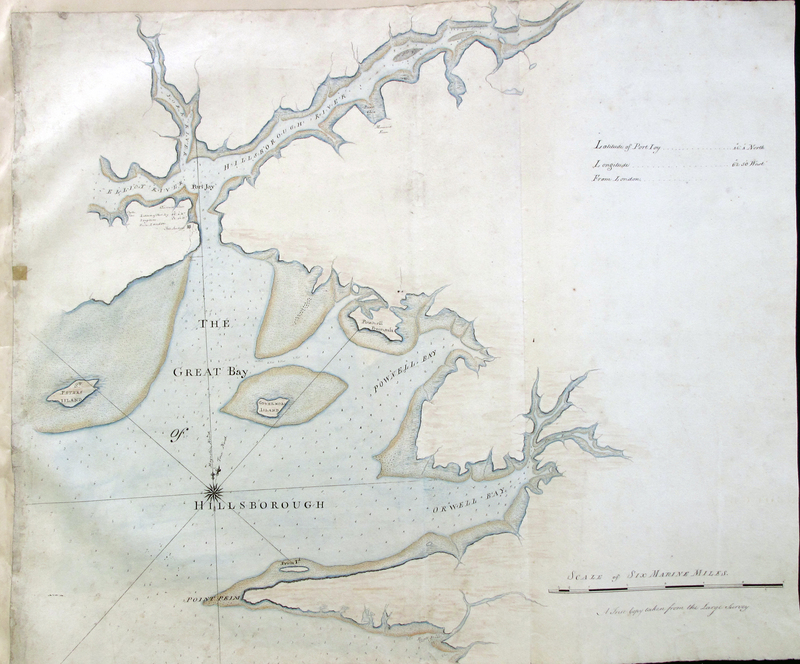 This essay examines the Board of Trade’s survey and plan for St. John Island (renamed Prince Edward in 1798). It is part of a larger study of British surveying and colonization in the maritime northeast, which is the focus of chapter 3 of my recent book, The New Map of Empire: How Britain Imagined America before Independence (Cambridge, Mass. : Harvard University Press). The full corpus of maps gathered together to support this book can be found at mapscholar.org/empire. Great Britain launched intensive surveys of North America and the West Indies after the Peace of Paris in 1763. The treaty declared all of the “countries, lands, islands, places, and coasts” that comprise modern-day Labrador, Newfoundland, and the Maritime Provinces (now known collectively as Atlantic Canada) to be unambiguously British. The Gulf of St. Lawrence, formerly the entryway to New France, had interrupted Britain’s claims to the North Atlantic coastal plain. Since 1713, the borderlands separating Nova Scotia and Acadia, inhabited largely by the Native Americans, had devolved repeatedly into violent confrontations. With the exception of two small, hardscrabble islands, St. Pierre and Miquelon, the lands and waters from the Great Lakes to Newfoundland became unequivocally British—in the eyes of European statesmen, if not to their thousands of indigenous and French inhabitants. To turn this paper sovereignty into an extension of its western empire, Britain attempted a directed program of colonization on St. John Island by using intensive geographic surveys to put all of this new colony’s land into the hands of entrepreneurial landlords. The failure of Britain’s St. John Island scheme underscored the tension at the heart of imperial reform in the generation before the American Revolution. Great Britain possessed the idea of using rigorous information about land, navigation, population, and resources to manage the progress of empire, but it lacked the state capacity to put this information to effective use. Emanuel Bowen, An Accurate Map of North America Describing and distinguishing the British, Spanish and French Dominions on this Great Continent According to the Definitive Treaty Concluded at Paris 10th Feby. 1763 (London, 1763), MR 1/26, UK National Archives. The Board of Trade initiated these surveys in order to give the British imperial state tools to plan directed programs of colonization. In their blueprint for the post-war empire, 1763’s “Report on Acquisitions in America,” the Board’s commissioners pictured a delimited settler society in the maritime northeast designed to exploit the region’s potential for commerce. They illustrated this spatial vision on a hand-annotated map that illustrated this plan for the king. Chief among its advantages was the Gulf’s valuable fishery, one long dominated by France’s as the region’s pêche sédentaire. When the Board ranked the economic benefits of the new American territories acquired in 1763, it put the northern fishery first as the “most obvious Advantage from the Cessions.” It celebrated the unification of an “Exclusive Fishery,” by which Britain claimed all the riversides and islands close to some of the world’s richest fishing banks. In framing a new policy to take command of this space, British officials recalled the long and bloody conflict between British fishermen and French and Mi’kmaq forces over the imperilled fishing station located on the Canso islands of eastern Nova Scotia. To pursue the fishery, they observed, Britain would have to mobilize settlers to clear, cultivate, and improve lands adjacent to these waters. The Board put army captain Samuel Holland in charge of the northern district of its General Survey of North America and ordered him to execute a comprehensive survey of St. John Island (renamed Prince Edward Island in 1798). Holland and his team embarked in September 1764 for St. John aboard the armed sloop Canceaux. After finishing this task, he and his surveyors moved on to map Cape Breton Island, the islands and shores of the western Gulf of St. Lawrence, and the Maine coast. [H. Coates], “A Sketch of the Island of St Johns in the Gulf of St Lawrence” 1764, CO 700/Prince Edward Island 2, The National Archives, Kew, Richmond, Surrey, Eng., http://discovery.nationalarchives.gov.uk/details/r/C3478003. 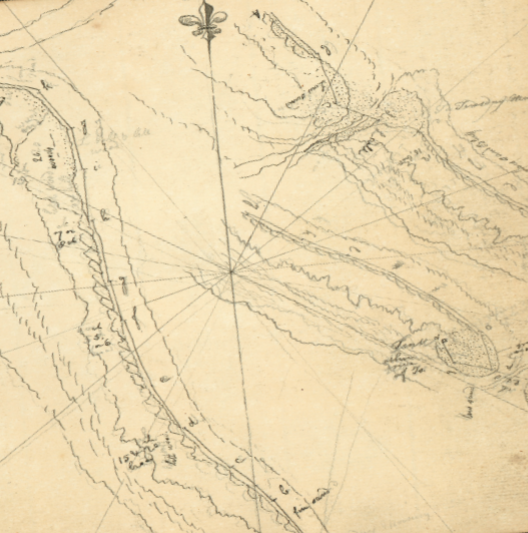 The island’s landscape illustrated on this 1764 army map bore the marks of past French settlement. Before British forces invaded St. John in 1758 and began deporting its inhabitants, French colonists had established fifteen small villages scattered around the island’s bays and inlets. By the time Holland arrived, fewer than three hundred French residents remained. [Henry] Mowatt, “Richmond Bay,” [ca. 1765], MS Charts and Maps, America, Vol. 1, Admiralty Library, Portsmouth, Eng. [Henry] Mowatt, “Bay of Hillsborough,” [ca. 1765], MS Charts and Maps, America, Vol. 1, Admiralty Library, Portsmouth, Eng. [Henry] Mowatt, “Cardigan Bay,” [ca. 1765], MS Charts and Maps, America, Vol. 1, Admiralty Library, Portsmouth, Eng. In February 1765, Holland dispatched four surveying parties to travel to different portions of the coast by dogsled and snowshoe. When the ice melted that spring, the Canceaux’s commander, Lieutenant Henry Mowat, dispatched small boats to transport the surveyors and soldiers around the island. Its midshipmen sounded the island’s waters along each stretch of shore, recording depths and hazards as part of the Admiralty’s complementary surveying effort, which generated charts of the island’s three major bays. Sample from Thomas Wright Field Book, Public Archives and Record Office of Prince Edward Island, Charlottetown, PE. The laborious process of plane-table surveying brought Holland’s men into sustained engagement with the landscape. The field book of assistant surveyor Thomas Wright records how the General Survey’s definitive image of the island’s northwestern coast, assigned to him as a survey area, materialized out of this process. Over the twenty-six days of work recorded in the summer of 1765, Wright’s party produced, on average, seven miles of surveyed coastline per day and measured a total of 846 segments that, when joined together, stretched just over 203 miles. 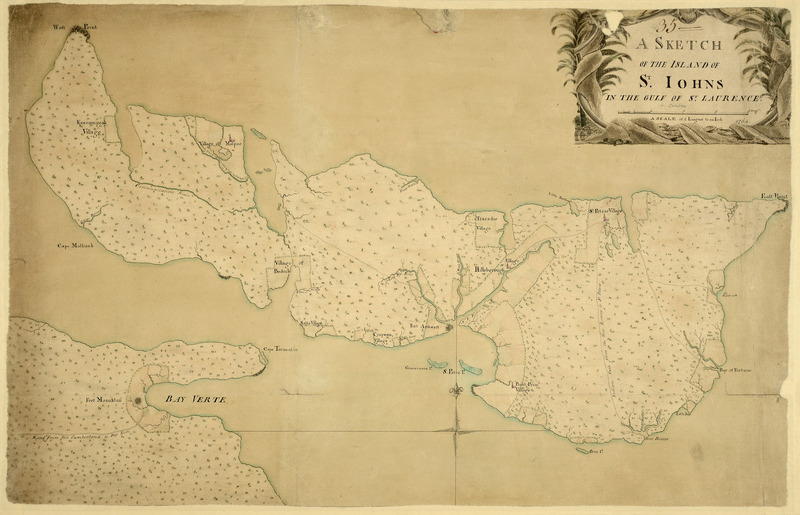 [Samuel] Holland, “Plan of the Island of St John in the Province of Nova Scotia, as surveyed agreeable to the order and instructions of The Lords Commissioners of Trade and Plantations” 1765, CO 700/Prince Edward Island 3, The National Archives, Kew, Richmond, Surrey, Eng., http://discovery.nationalarchives.gov.uk/details/r/C3478004. By the end of the summer of 1765, these coastal and river surveys were complete, and in a tent set up as a drafting room, the surveyors fought off swarms of mosquitoes to compile their large-scale field surveys into a general manuscript “Plan of the Island of St. John,” which divided the island into sixty-five townships, three towns, fourteen parishes, and three counties. 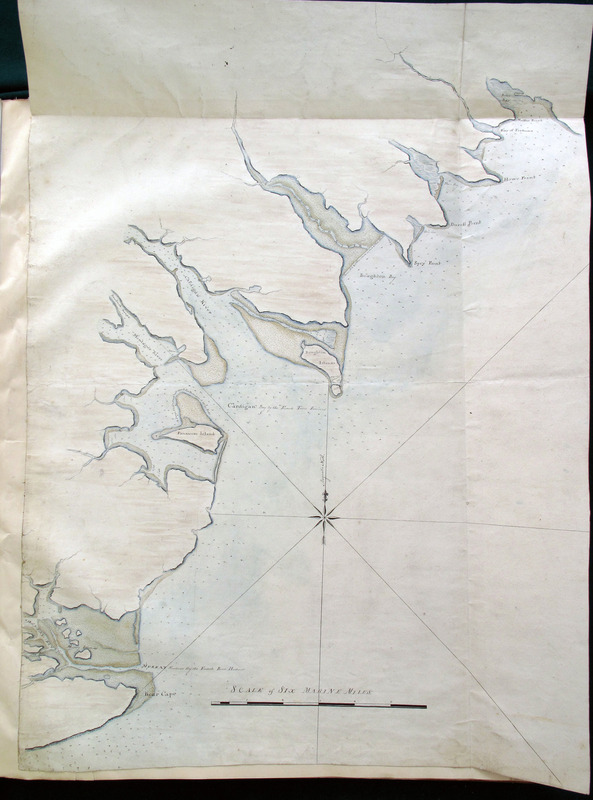 [Samuel Holland] and John Lewis, “A Plan of the Island of St. John in the Province of Nova Scotia” 1765, MR 1/1785, The National Archives of the United Kingdom, Kew, Richmond, Surrey, Eng., http://discovery.nationalarchives.gov.uk/details/r/C4560812. On these manuscript maps that summarized his survey’s findings, Holland appraised each township as to its convenience for prosecuting the fishery, the qualities of its soils for farming (ranking the land “bad,” “indifferent,” “pretty good,” “good,” and “very good”), and its proximity to three planned towns. Tables of this assessment appeared next to the image of the divided island on the maps he sent to London. Samuel Holland, “A Map of the Island of St. John in the Gulph of S. Lawrence in North America from an actual Survey made in 1763 By Order of The Right Honourable The Lords Commissioners for Trade and Plantations” 1767, Maps K.Top.119.96.2, the British Library, London, UK, http://primocat.bl.uk/F?func=direct&local_base=ITEMV&doc_number=004987877. The Board of Trade issued a call for proposals to develop St. John on May 9, 1764. With the results of the survey at hand by 1766, the Board invited petitioners for townships grants to the Plantation Office to be interviewed. There, they made their cases that they stood ready to populate the island in return for the privilege of taking possession of such large portions of it. Approved petitioners wrote their names on a paper ballot. On July 23, 1767, they witnessed the drawing that assigned the townships located on these 1765 manuscript maps. Holland added the names of St. John’s new proprietors to his table of township data on a handsome presentation map in 1767. [Egmont Bay], [ca. 1767? ], B5300 Shelf UK, Archive of the United Kingdom Hydrographic Office, Taunton, Eng. Board of Trade secretary John Pownall drew number 13 in the ballot. Holland proclaimed this “one of the best Townships on the Island,” ideally situated for the fishery from its location on sheltered Richmond Bay. French colonists had cleared 750 acres of prime land within the township and left behind twenty-four houses and barns (as well as a church). British officials, military officers, Members of Parliament, and London merchants claimed these vast tracts of land, making of a new class of metropolitan colonizers favored by the Board of Trade to settle and develop the new territories. Samuel Holland, A plan of the island of St. John with the divisions of the counties, parishes, & the lots as granted by government, likewise the soundings round the coast and harbours (London, ). From Geography and Map Division, Library of Congress, Washington, D.C., http://hdl.loc.gov/loc.gmd/g3426f.ct002331. The final product of this colonization was a printed and widely disseminated map of St. John, one widely anthologized in published atlases of the 1760s and 1770s. The Board of Trade’s scheme for settling St. John displaced independent colonists as the primary agents for New World colonization. In their place, trained surveyors documented the land’s value, and a coterie of distant landlords, entrusted by the state with a regulated monopoly on real property, took on the risks and anticipated the rewards of settling a new colony. S. Max Edelson is a professor of history at the University of Virginia and author of The New Map of Empire: How Britain Imagined America before Independence and Plantation Enterprise in Colonial South Carolina. Prof. Edelson is also co-director of the MapScholar and VisualEyes projects, two online visualization platforms for historical visualization. You can find him on Twitter at @maxedelson. “Report on Acquisitions in America,” June 8, 1763, in Documents Relating to the Constitutional History of Canada, vol. 1, 1759–1791 (Ottawa, 1907), 100, 142, 137, 134; Emanuel Bowen, An Accurate Map of North America Describing and distinguishing the British, Spanish and French Dominions on this Great Continent According to the Definitive Treaty Concluded at Paris 10th Feby. 1763 (London,[ca. 1763]). From The National Archives of the UK, Kew, Richmond, Surrey, MR/1 26. Stephen Hornsby, Surveyors of Empire: Samuel Holland, J. F. W. Des Barres, and the Making of the Atlantic Neptune (Montreal: McGill- Queen’s University Press, 2011), 46-49, 101. For a detailed history of the island, see J. M. Bumsted, Land, Settlement, and Politics on Eighteenth-Century Prince Edward Island (Kingston, ON: McGill-Queen’s University Press, 1987). See also Andrew Hill Clark, Three Centuries and the Island: A Historical Geography of Settlement and Agriculture in Prince Edward Island, Canada (Toronto: University of Toronto Press, 1959). [H. Coates], “A Sketch of the Island of St Johns in the Gulf of St Lawrence,” 1764, CO 700/Prince Edward Island 2, UK National Archives. Hornsby, Surveyors of Empire, 50-54; [Henry] Mowatt, “Richmond Bay,” [ca. 1765], MS 368, MS Charts and Maps of America, vol. 1, UK Admiralty Library, Portsmouth; Mowatt, “Bay of Hillsborough,” [ca. 1765], MS 368, MS Charts and Maps of America, vol. 1, UK Admiralty Library; Mowatt, “Cardigan Bay,” [ca. 1765], MS 368, MS Charts and Maps of America, vol. 1, UK Admiralty Library. 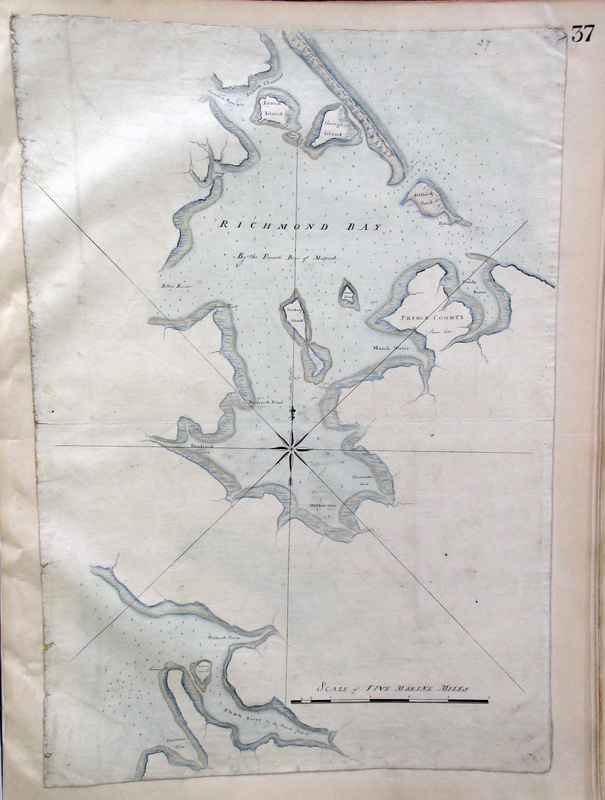 Thomas Wright, [St. John Island survey sketches], 1765, Thomas Wright Field Book, Public Archives and Record Office of Prince Edward Island [Canada], Charlottetown, PE. Hornsby, Surveyors of Empire, 54; [Samuel] Holland, “Plan of the Island of St John in the Province of Nova Scotia, as surveyed agreeable to the order and instructions of The Lords Commissioners of Trade and Plantations,” 1765, CO 700/Prince Edward Island 3, UK National Archives. [Samuel Holland] and John Lewis, “A Plan of the Island of St. John in the Province of Nova Scotia,” 1765, MR 1/1785, UK National Archives. Maps K.Top. 119.96.2, The British Library, London. “Land Grants in Prince Edward Island, 1767,” 7; Jack M. Sosin, Whitehall and the Wilderness: The Middle West in British Colonial Policy, 1760–1775 (Lincoln: University of Nebraska Press, 1961), 124–126. Mr. [Thomas] Knight to [Dartmouth], October 10, 1773, CO 5/228: 268–269, Library of Congress Transcripts, Library of Congress, Washington, DC; Harry Baglole, “Patterson, Walter,” in Dictionary of Canadian Biography, vol. 4, http://www.biographi.ca/en/bio/pattersonwalter4E.html; Samuel Holland, A plan of the island of St. John with the divisions of the counties, parishes, & the lots as granted by government (London, ). Featured image: Samuel Holland, A plan of the island of St. John with the divisions of the counties, parishes, &amp;; the lots as granted by government, likewise the soundings round the coast and harbours [Detail] (London, ). Geography and Map Division, Library of Congress, Washington, D.C.